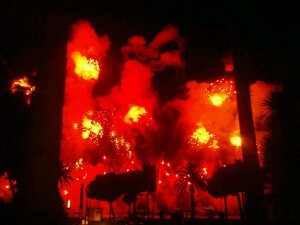 The annual fireworks festival in Cannes is one of the highlights on the French Riviera. But weather can occasionally cause the shows to be postponed. If you’re anywhere near Cannes, the good news is that a postponed show will be held on August 18 2016 in the bay of Cannes. The show will feature the work of Australia’s award-winning Howard & Sons. the two generations have won multiple awards and worked for DisneyLand and DisneyWorld. These events are massively popular. Obviously, the big crowds head for the Croisette, and most of the hotels will be organising special meals with views of the show. I have also head that boats can be rented to catch the show from the sea. In every case, I strongly recommend leaving your car in a car park and either walk down, catch a train from Juan-les-Pins or La Bocca or get your bicycles out!